It's CES 2015 and the team members of Budapest and Boston-based startup Liber8 Technology are panicking. Its first product, a curved E Ink smart bracelet named the Tago Arc, which has been two and a half years in the making, is almost ready for its Indiegogo debut. And LookSee Labs has just announced a curved E Ink smart bracelet at the world's biggest tech show in Las Vegas. "Really it was a nightmare," Liber8 co-founder and director of communications Nikoletta Szirmay told Wareable. "We said 'wow, this can't be true, they are doing the same thing'. This was before our campaign, when there were only four of us including myself and the founder Zoli Kovacs." As it turned out, the LookSee bangle uses Bluetooth to send customisable patterns to the curved display and lasts for a year on one charge. The Tago Arc's clever use of NFC for that connection and the fact that the E Ink display is so low power means the wearable can draw enough energy from your smartphone during the transfer. That's right, it never needs charging. Since then, Liber8 has focused on designing a high fashion wearable that allows the wearers to swap out patterns to change its aesthetics. So much so, in fact, that Kovacs and Szirmay decided against sending alerts to the bracelet, even though this would still be possible with the no-charge NFC system. "We just want to have one high fashion bracelet with a seamless user experience," said Szirmay. "You just have to tag and wear and it looks like real, high fashion jewellery. Women can fall in love with it but they can also express themselves." Liber8 has working tech prototypes of the Tago Arc, in plastic, and a design prototype of what the $250 smart bracelet should look and feel like when it ships to over 500 Indiegogo backers in December. First, the tech - the curved E Ink screen is exactly what you'd expect - a little washed out right now, like a Kindle display, but Szirmay says that a priority is to improve contrast in the final model. The NFC transfer of a new pattern from the Tago app was quick - less than the 15 seconds Liber8 quoted during the campaign and Liber8 says it can be as short as one to three seconds. As with any NFC connection, the bracelet has to be held right up to the smartphone to make the transfer - a small way that Bluetooth has the upper hand but definitely worth it considering the Arc never needs charging. 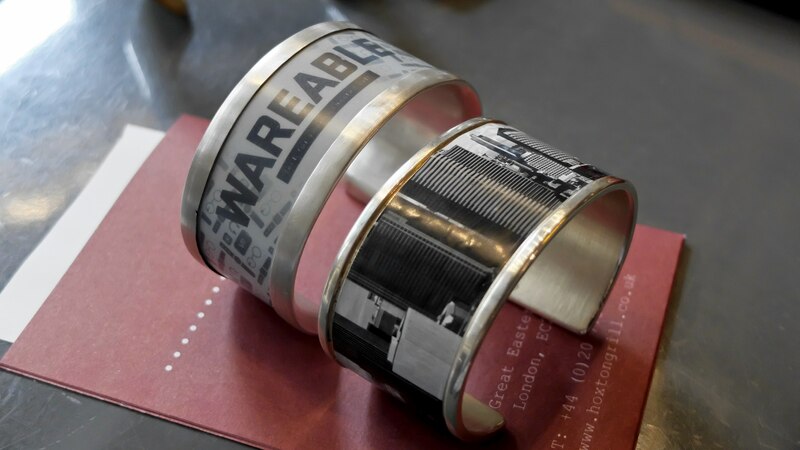 And just to prove that Liber8 can put any pattern on the bracelet - that is approved for its Tago community launching this autumn - we are treated to Wareable's logo displayed on one of the prototypes. As for the design, we tried on the stainless steel prototype of the cuff and it felt nice and expensive, a bit heavy but not too much to cause concern and again, it should be lighter in the final product. The Arc will come in silver, gold and black finishes and because Liber8 just tipped over $100,000 in its campaign, every backer will get a colourful silicone band too. Put simply, if Liber8 can build a smart bracelet that looks and feels like its design prototype - with a wide, curved E Ink display and a slim metal band - without compromising on the tech that seems to perform in our brief demo, then it will have a winner on its hands and backers won't be disappointed. The Tago community, which will be live before backers receive their bracelets, will allow approved designs to be sold for $1 - $5, with higher rates for limited edition patterns from well known names. Liber8 is in talks with Maison Marquise, a design house based in Budapest which favours monochrome bird prints, to become one of the first labels to offer bespoke patterns for around $20 each. Currently, it has a few contributors, in Budapest, Scotland, Singapore, creating graphics and it's looking to entice students interested in earning money. Ultimately, Liber8 knows that building a trusted fashion brand takes years so it is both looking for investors to continue to develop its technology and for partners to use its tech in existing fashion lines. "Getting into the fashion world is a really big challenge," said Szirmay. "We went to Paris Fashion Week just to meet people and get feedback but companies wait years to show there. We also do a lot of work in the US but from everyone I talk to and everything I read, I think London is doing wearable tech better." "We are looking for partnerships to develop this display in other sizes," she said. "Maybe we can build this display into other wearables, for example bags, belts, sunglasses and so on. Liber8 would still focus on the technology." The startup might not have shipped its crowdfunded bracelets yet but it has the "sweet problem" of more potential demand than it can produce with its team of ten people. The Indiegogo campaign was most popular in the US, the UK and South Korea but Liber8 has also had lots of interest from China and Japan. With its focus on playfulness and customising personal style, it's a neat fit for Asia. "We have businesses in China and Japan who are interested but we have been warned that if the product is shown on Chinese TV, we will get millions of orders. Maybe next year."